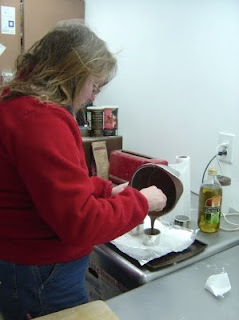 The Gunk Haus test kitchen was in full swing again today. Here you see the chef experiment with desserts (yes, Gia and Heidi, E! owns more clothing than just a green fleece, for instance a red fleece). The dessert didn't turn out as anticipated, which brings me to the topic of failures. Not every experiment at Gunk Haus test kitchen is successful. The reasons are many, ingredients, recipes, process, and human error, it's all in the cards. Personally, I eat all the mistakes, unless they are completely inedible, which hasn't happened yet. 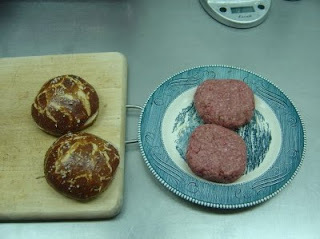 Of course I prefer the yummy stuff, say burger on a homemade pretzel bun. Oh, look, just like in this picture. Add some homemade paprika sauce, and dinner is served. 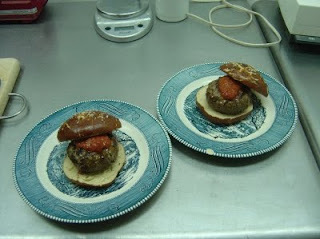 The burgers look scrumptious!!! No worries on the outfits. I am sooo glad no one sees what I wear in my home office, most days!!! Function and comfort trump fashion more often than not. Keep up the great work you two!!!! Jody and I are happy to make ourselves available as guinea pigs, you know. In case you ever get tired of all those pretzel buns ... speaking of which, you guys might have just come up with a fine new nickname for my sweetie! Whichever way you twist it, the nickname pretzel buns has a decidedly naughty ring to it. Patience on the test eating, there'll be plenty of opportunity in the not too distant future.